There are few greater pleasures than kicking back and relaxing on the couch with a bowl of candy and a good book or movie. Sadly, that comfort is usually short-lived if you have guests visiting or live with other people, because, after all, who doesn't love a sweet treat every so often? Naturally someone's going to want to snag some of your goodies, meaning you keep getting interrupted. Learn how to make your own DIY candy dispenser so that your friends, family, roommates, and house guests will be able to serve themselves and you'll finally get that peace and quiet you've been itching for. 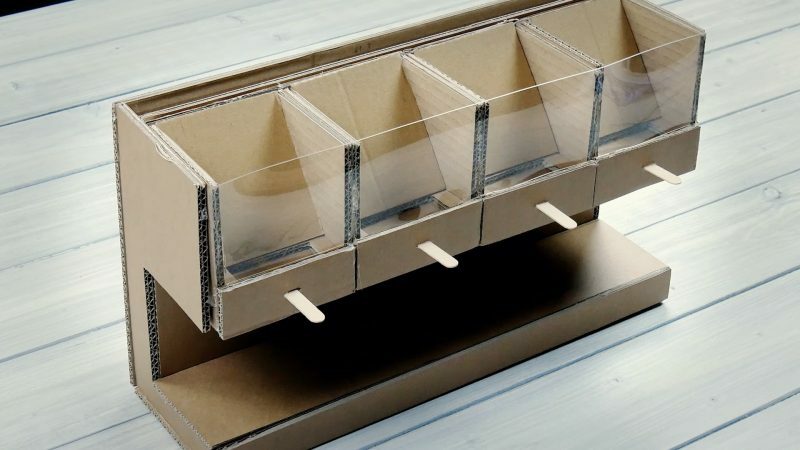 The candy dispenser consists of a frame and four chambers, each assembled and attached individually. The individual elements that make up the frame are shown in the following picture. 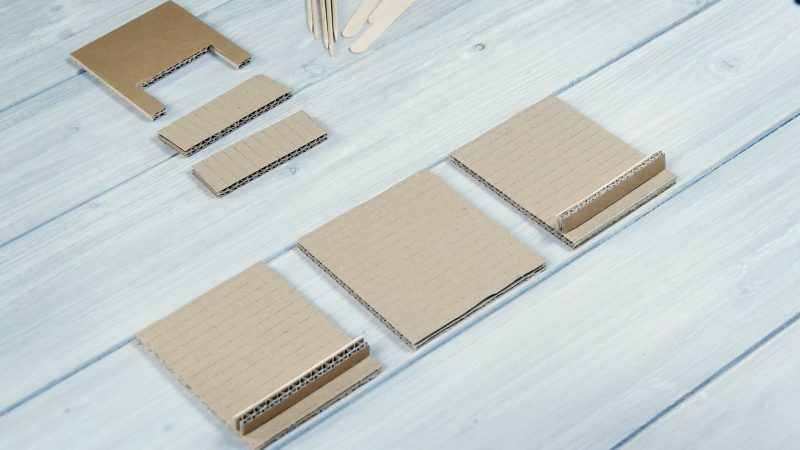 Draw the respective measurements with a ruler and pencil on a correspondingly large piece of cardboard and cut out the individual parts. 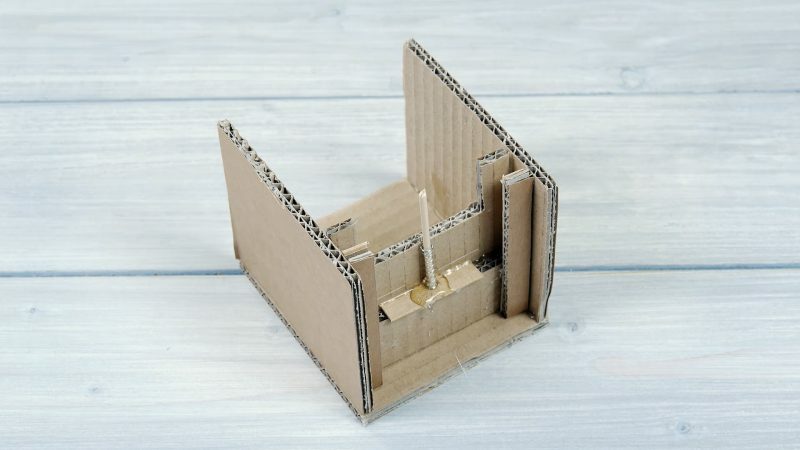 Check out the picture to see which cardboard parts make up the chambers. 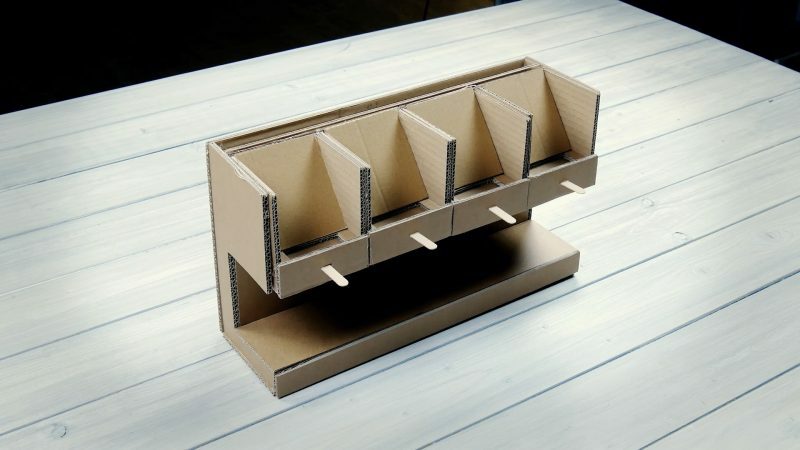 Since the dispenser consists of four chambers, you will need to make four of these compartments. 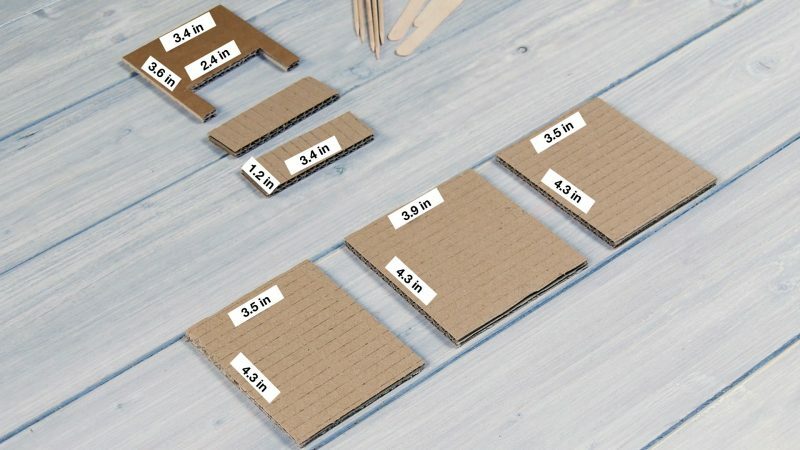 Draw the dimensions for each piece of cardboard and cut out the pieces. 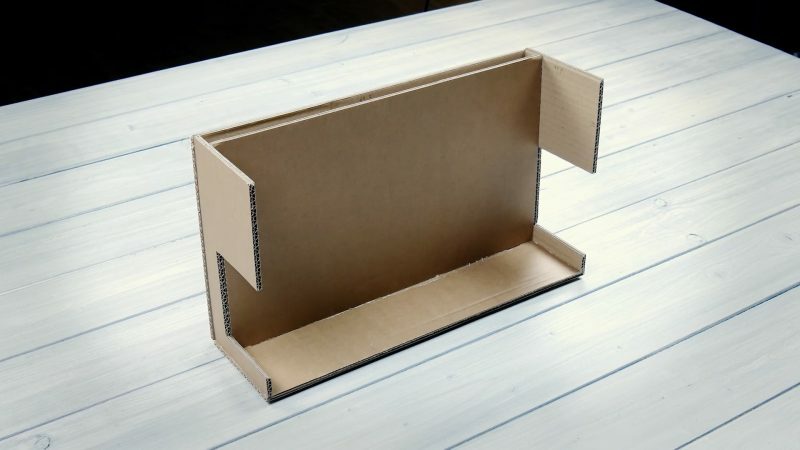 In addition to the sections shown here, four additional pieces of cardboard are needed for each chamber, which will be explained further below. 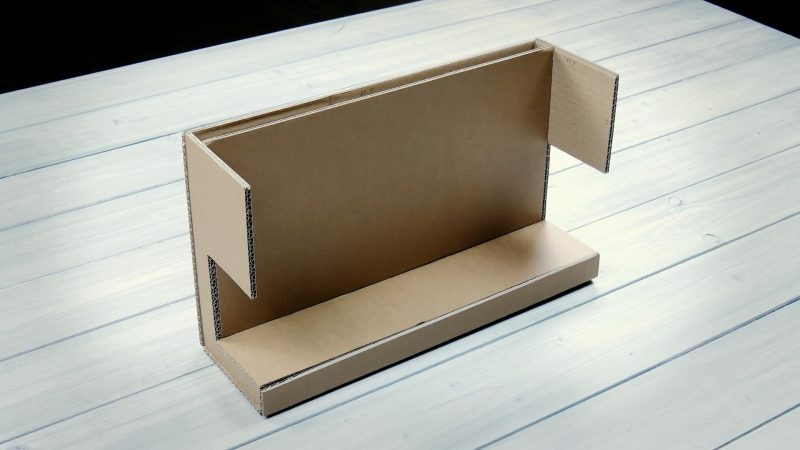 The frame base is the rectangular cardboard piece measuring 4.6 in x 16.3 in. 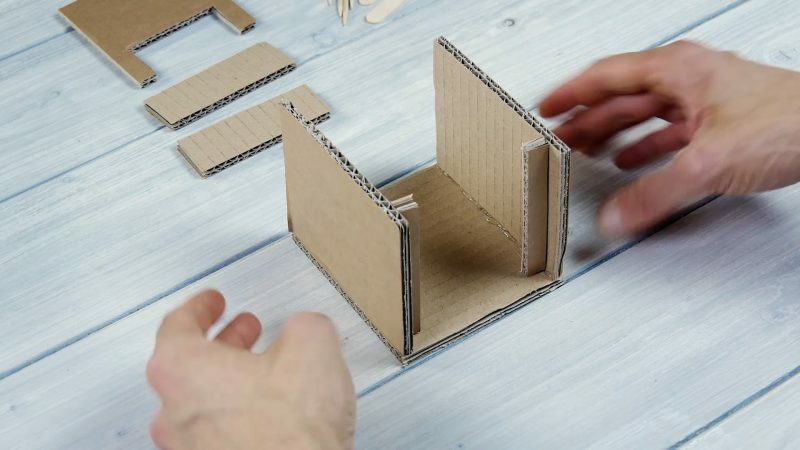 Take the two cardboard pieces that have sections cut out, and line them up with the edge. 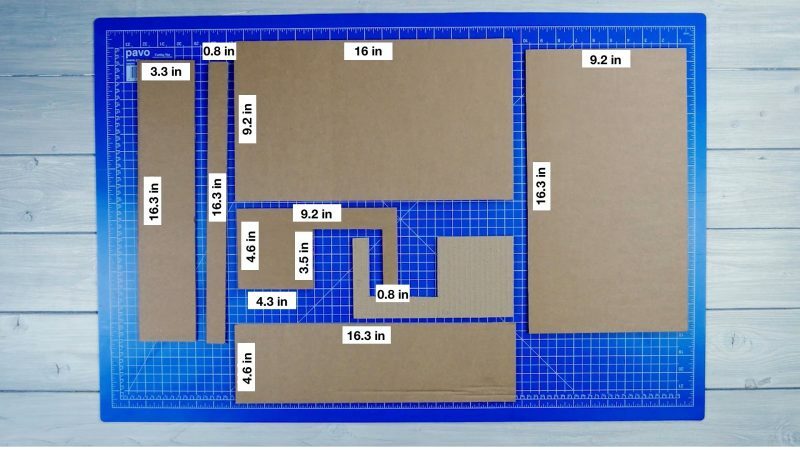 1.2 Take the largest piece of cardboard (measuring 9.2 in x 16.3 in) and glue it to the edges of what you just created. This will form the back wall. 1.3 Place the section measuring 9.2 in x 16 in and place it in front of the back wall. It should line up with the edges of the side panels where the cut out section begins. 1.4 Glue the section measuring 3.3 in x 16.3 in to the horizontal edges of the side panels. 1.5 Glue the section measuring 0.8 in x 16.3 in to the front as an appliqué on the foot of the base. 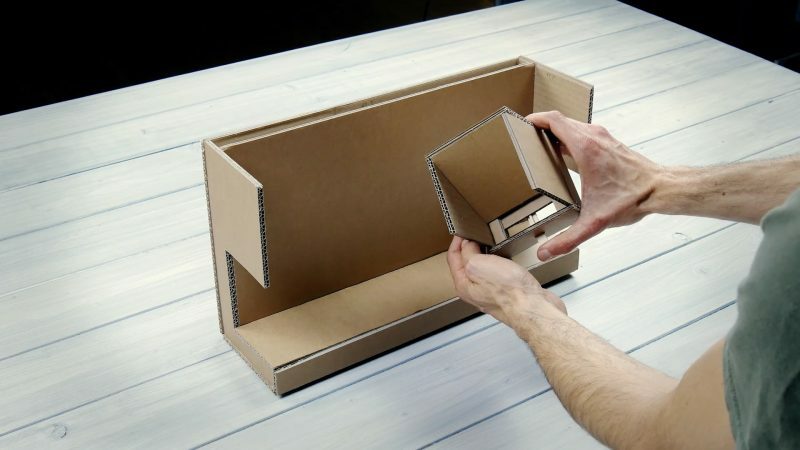 Repeat Steps 2.1—2.10 four times to create four individual chambers. 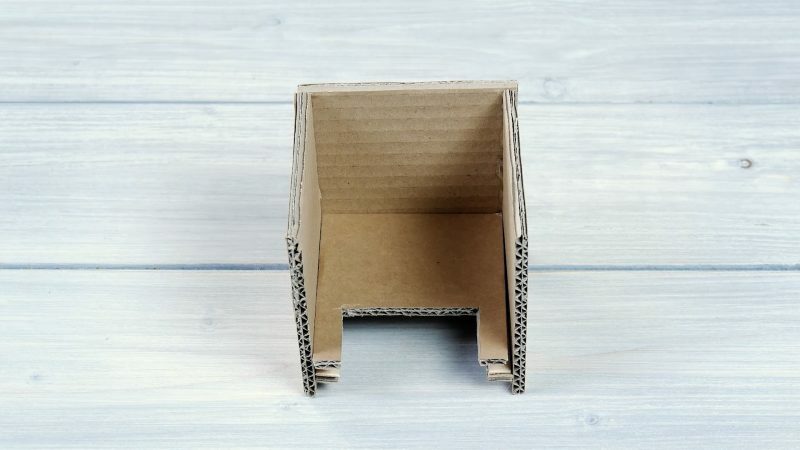 You will first need to assemble a simple section that was not listed in the overview. 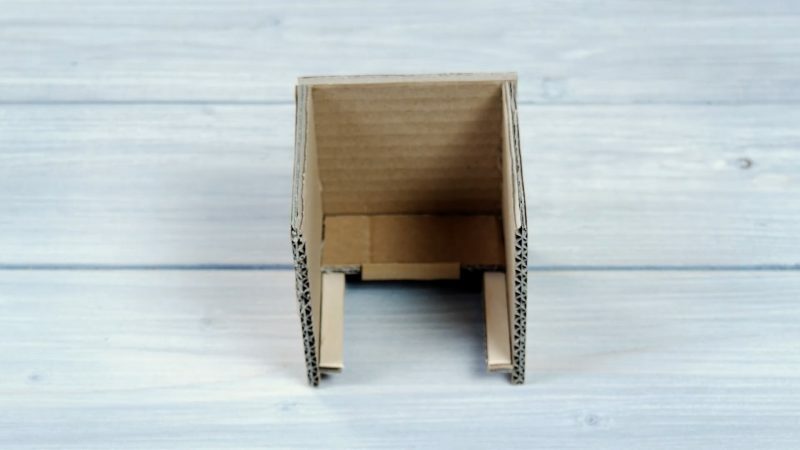 2.1 This section consists of a cardboard strip that is 3.5 inches long and about the width of a popsicle stick. 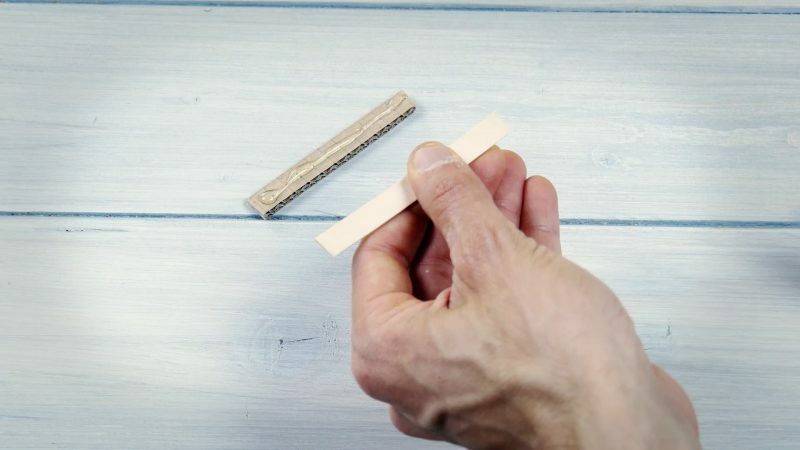 Cut the popsicle stick to the appropriate length and glue it on the cardboard strip. You will need two of these for each chamber. 2.2 Glue the newly-assembled section a little further back from the lower edge of the cardboard piece measuring 3.5 in x 4.3 in. The side with the popsicle stick should be facing towards the back. 2.3 Glue each of these sections flush with the edge on the cardboard piece measuring 3.9 in x 4.3 in. 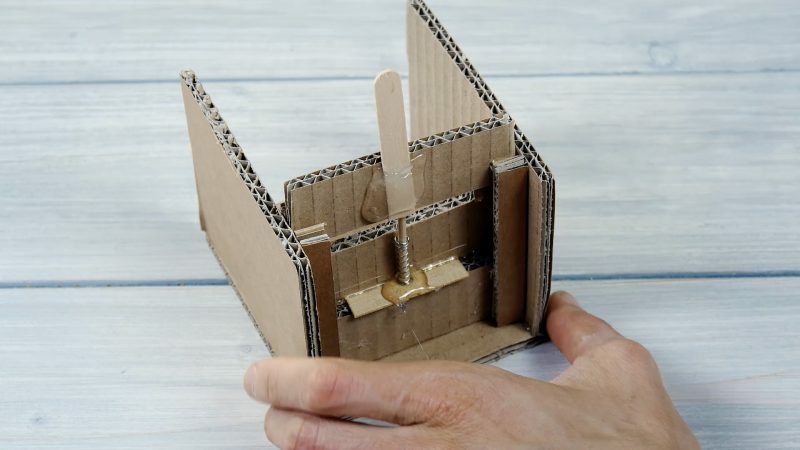 2.4 On one of the two sections measuring 1.2 in x 3.4 in, stick a piece of a popsicle stick to the edge and, as shown below, glue it onto the horizontally placed cardboard pieces with the wood. 2.5 Glue the 3.4 in x 3.6 in x 2.4 in section (the one with a portion cut out) on top of the recently inserted section so that the cut out portion is near the front. 2.6 Now you will assemble the chamber's sliding device. 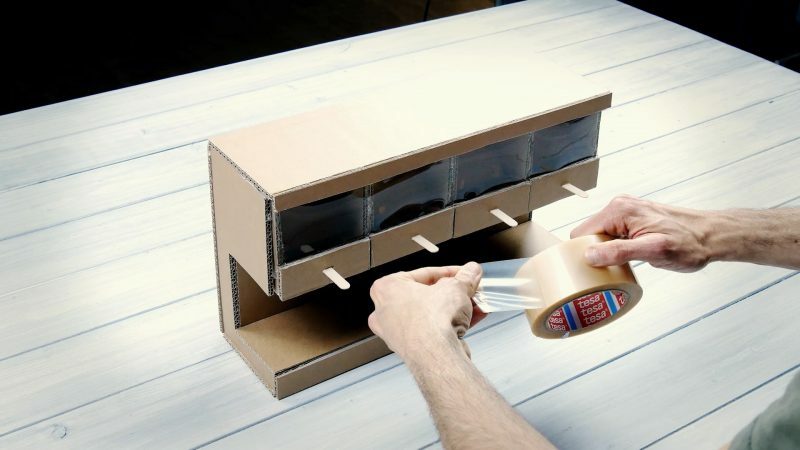 To do this, cut a popsicle stick in half and glue it to the second section measuring 1.2 in x 3.4 in. 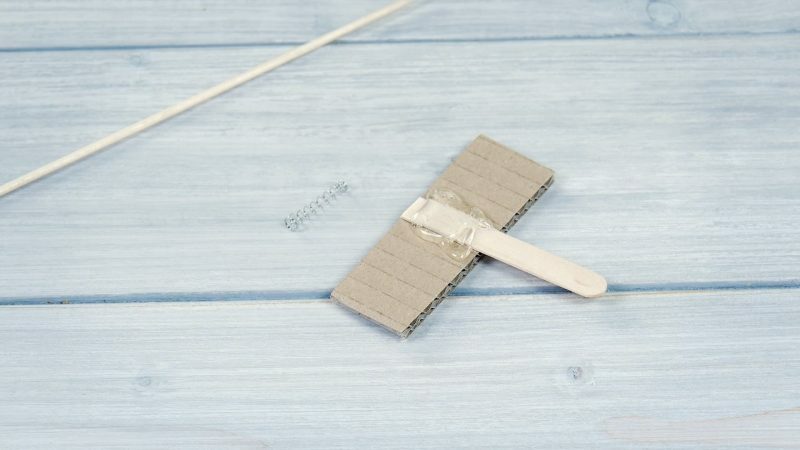 2.7 Take the spring from a ballpoint pen, place it on the wooden stick, and glue this to the section you created in Step 2.4, as shown in the picture. 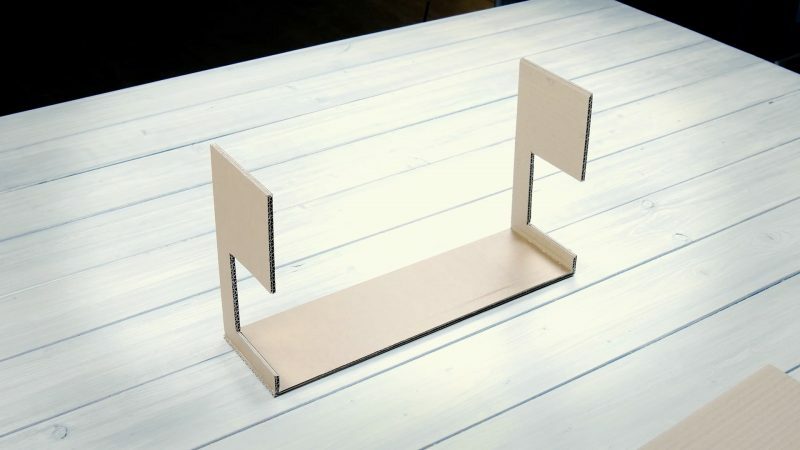 Adjust the length of the wooden stick so that it lines up with the height of the side panels. 2.8 Place the sliding device from Step 2.6 on the wooden stick. 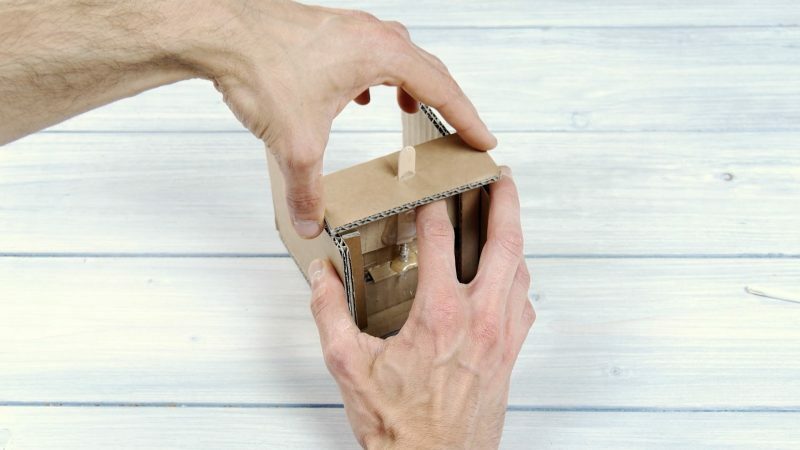 Clamp the wooden stick between the glued wood and cardboard. 2.9 Another section not mentioned in the overview is the trim panel, which you will cut a slit in and glue on the edges of the side panels. The width should correspond to that of the chamber. 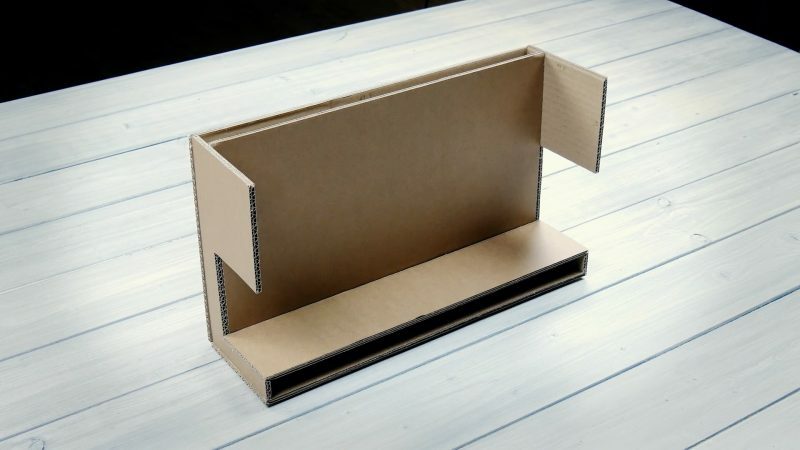 It should also be tall enough to conceal the sections it covers. 2.10 The last section, which was left unmentioned in the overview, is the slope that you insert into the chamber, which should stop a bit before the opening. 3.1 Attach the chambers to the frame. 3.2 Trim the PVC film and attach it to the front of the chambers. 3.3 Finally, put a lid on the candy dispenser and secure with a few strips of clear packaging tape so you can easily open and close the lid to fill the chambers with candy. Feel free to decorate your candy dispenser however you want! Now fill your candy dispenser with whatever sweet treats you want! You can also decorate each chamber with the logos of your favorite candy. Place a dish under each chamber, press the button, and watch as the culinary delights tumble through the trapdoor and make their way to your eagerly waiting tummy — talk about a great gift idea! And it's not just for kids, you silly rabbit. 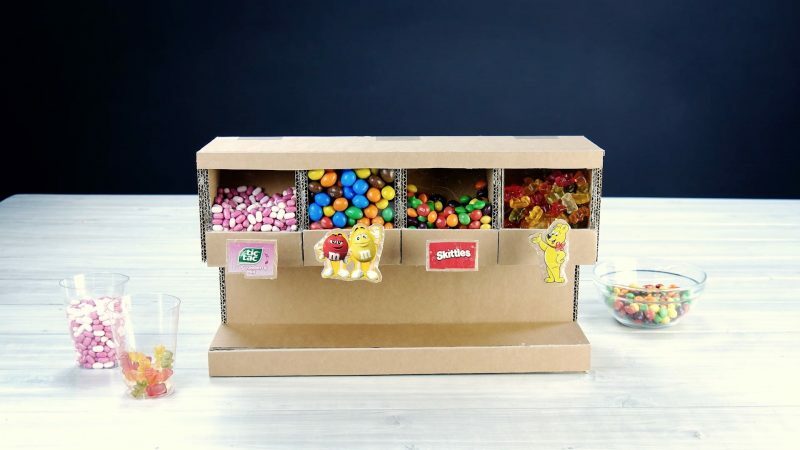 Adults will also go crazy for this homemade candy dispenser, so you might want to keep it in a safe place if you're not in the mood to share. To paraphrase another slogan of a very famous and delicious brand: kids and grownups love it so, the happy world where candy flows.